Historic diamond quarter inspires major new artwork at Farringdon Elizabeth line station - Crossrail . For information about the Elizabeth line please visit the Transport for London website. 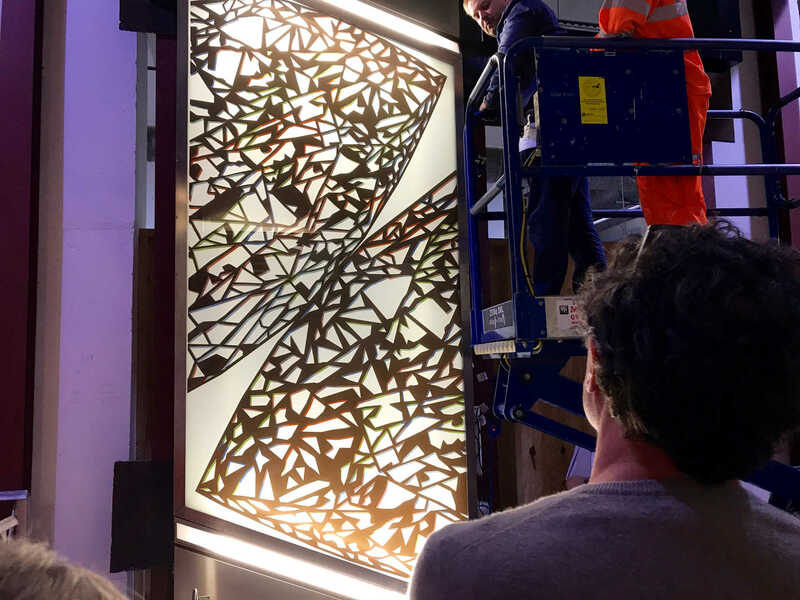 The artwork supersizes Periton’s long established practice of creating delicate paper-cut outs, with the design digitally printed across 45 glass panels lining the station – each up to 3 metres tall and 2 tonnes in weight - to create a huge glazed frieze. 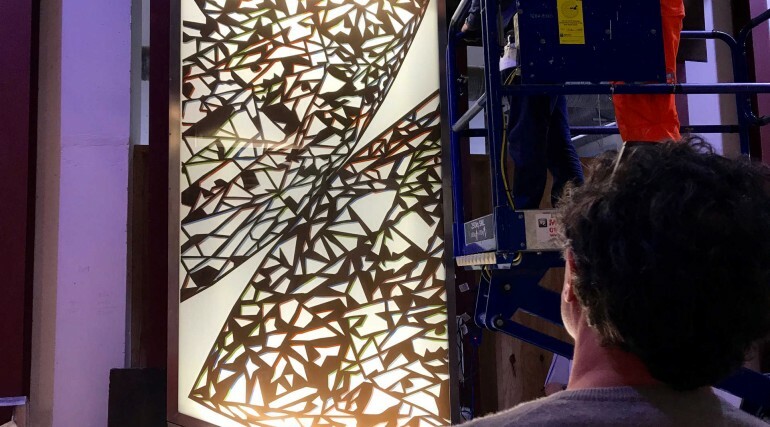 Artist Simon Periton said: "I’m really looking forward to finally seeing all the glazed artwork panels installed across both ticket halls at Farringdon station. It’s been a long, detailed process from my initial proposals through all the testing stages working towards fabrication and installation. "The feel of each site is very different. 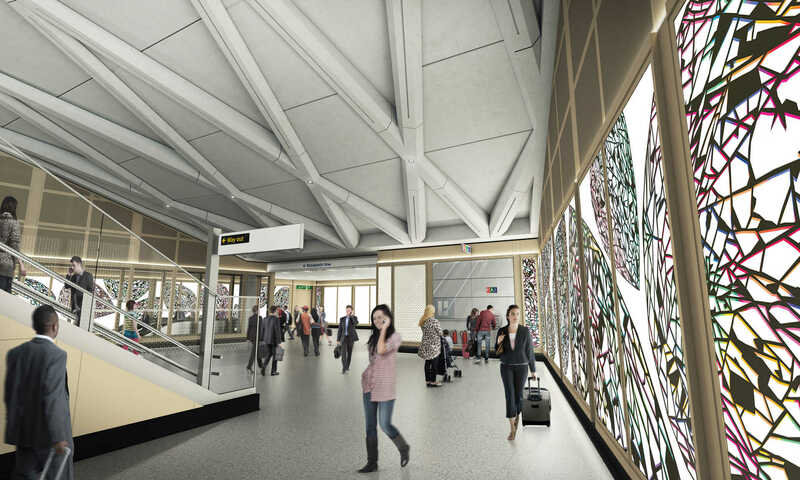 The artwork for the Eastern Ticket Hall is visually more organic. Not only does the intricate pattern reflect the elaborate Victorian metalwork of Smithfield Market, it also references fragmented elements of the fauna and flora sold traditionally in the market. The design for this site is printed to emulate etched glass. 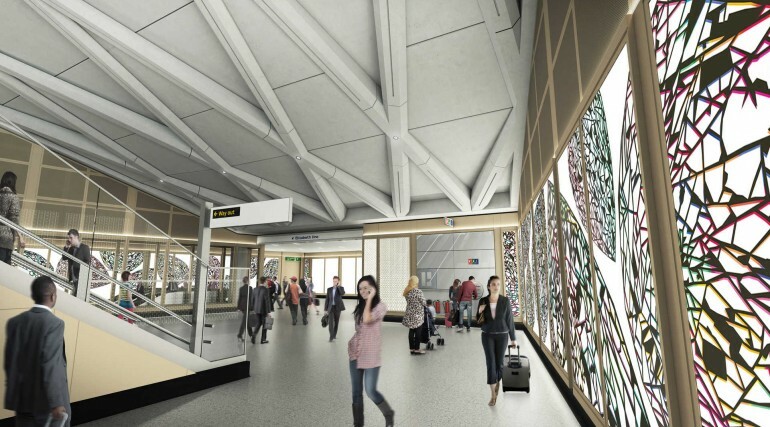 "The artwork design for the Western Ticket Hall is based on a large faceted diamond. A series of these giant gems cascade down and spin around the concourse, animating the space and echoing the movement of commuters. 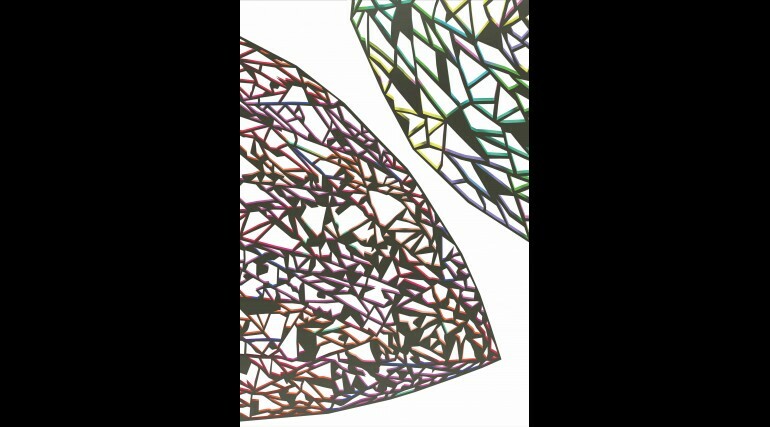 This design will be printed in bright coloured ceramic inks." Major works of public art are being integrated into many of the new Elizabeth line stations as part of the Crossrail Art Programme - a line-wide exhibition designed to reflect the ambition of London’s newest railway and the communities it serves. 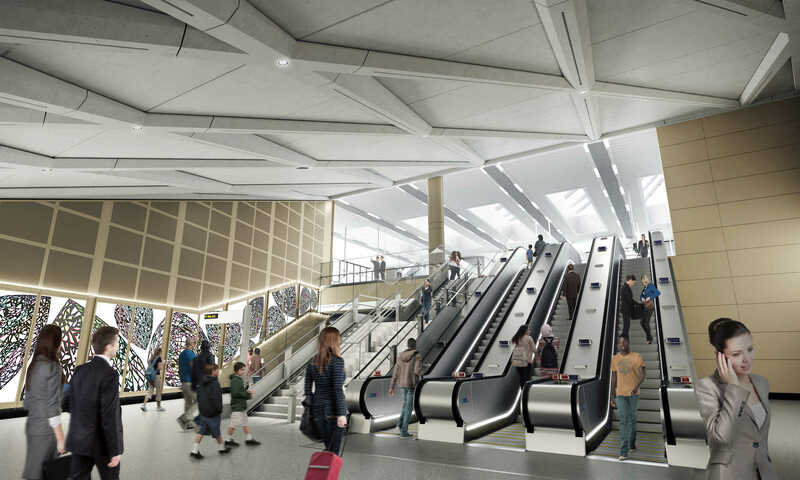 Major works of public art will be integrated into many of the new Elizabeth line stations to create a line-wide exhibition that reflects the ambition of London’s newest railway and the communities it serves. 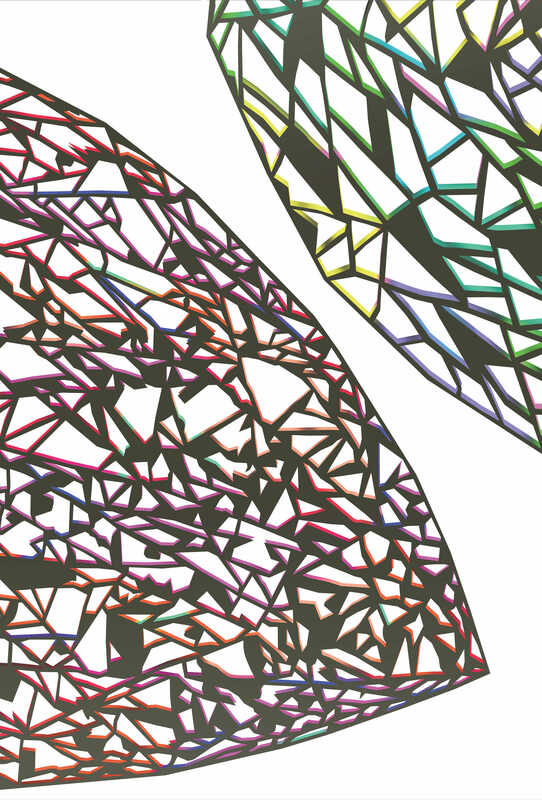 Together with internationally renowned London-based art galleries and a respected group of art-world representatives, the Crossrail Art Foundation is delivering the largest collaborative public art commissioning process in a generation. The project falls outside Crossrail’s £14.8 billion core funding. The Crossrail Art Foundation is raising funds from corporate funders, with each contribution being match funded by the City of London Corporation. The Crossrail Art Foundation registered as a charity in England and Wales (1159310) and is a company limited by guarantee (company number 09200269), with its registered office at 50 Broadway, London SW1H 0BL. The total funding available to deliver Crossrail is £14.8bn. The Crossrail route will pass through 40 stations and run more than 100km from Reading and Heathrow in the west, through new twin-bore 21 km (13 miles) tunnels below central London to Shenfield and Abbey Wood in the east. Crossrail is being delivered by Crossrail Limited (CRL). CRL is a wholly owned subsidiary of Transport for London. Crossrail is jointly sponsored by the Department for Transport and Transport for London.